蕭麗虹/竹圍工作室藝術總監 Culture perspective must be reviewed now after Jan 13th! While the president is busy sorting out the cabinet, the minister of culture is usually the last to be assigned! But please do consider the importance of that post! Please check the creative collaborative personality of all your cabinet team, as that is vital for jointly solving the ills that is plaguing Taiwan in the past years, as witness in the loss to our global competitiveness. What does that got to do with culture? Indeed it does, as culture is the vital and effective tool for our sustainable development. Our creative younger generation is the true essence of our potential, and their contribution will help provide the resilience of this island in face of global economic slowdown and worldwide environmental degradation, as witnessed by the recent market indicators. Valuation perspective of culture must be revamped towards a broader context. Our national priority now is economics, so let us analyses the economic value of culture as in any business model. We will find that culture is a capital just as important an investment as in financial, technical, land and labor capital investments. With current trends of fast innovation, big data, data mining, we cannot afford to lose our creative talent pool who can lead us through to the forth industrial revolution, a topic being discussed at the Davos world Economic Forum now. We need to acknowledge that support of a culture budget, and provisions of a dynamic creative ecology, will release the full potential of our young talents; helping to turn their outputs into assets that the nation can use, and not an expense for outsourcing playful entertainment. Implemented properly, culture budget will produce for each tax dollar for dollar, long term investment into our society. Its impact is visible only if we have longer vision, higher goals and patience to support incubation till its full fruition in four years, and definitely reap bountifully its long tail outcome, by 2030. Professionals such as UK’s Charles Landry, with his visionary guidance to global majors on creative and sustainable cities, has also custom-designed such a creative framework for Taipei city in 2015. 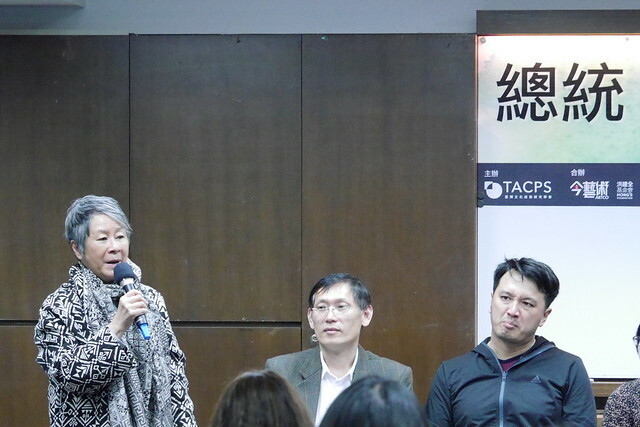 In his publication, he highlighted that we have in Taiwan, and our capital in Taipei specifically, a great pool of talents, but we are losing them rapidly to other Asian cites. They can bring forth various unique values that is embedded into our society. We need diverse culture think tanks to analyze the ways Taiwanese creative youth has contributions to our national priorities, and help government intervene the outflow. http://www.urstaipei.net/article/17213 This article is to emphasize again, budget for culture is an investment and not an expense. International and local cases have proven that investment in young culture talents has high outcomes to various levels of government, businesses and many strata of society. Let us review a few locally and internationally tested added values from investing in culture, and let art be part of the mechanism for change. 1 heritage value: as tangible history of our identity. It is easily understood to have value for tourism, but smaller venues or alternative sites should be releases as hubs and clusters for creative incubation of younger talents, who are starved for space for networking and prototyping their new ideas. The creative industry law as was laid down, needs to be modified with better mechanism and incentives on space provisions for talents. These sites can be the hotbed for authentic local creations from our youth, the place to innovate and not just kitsch corners for culture consumption. Too many abandoned and underused government venues are still not revitalized for new contents, as documented by the data of culture activists Yao Jui Chung. http://www.yaojuichung.com/htdocs/?page=publications&publications_id=28#pubspage 2 innovation value: Industrial innovations require systematic breakthroughs; global networks such as Arts & Business UK and Australia have tested tangible results with inclusive creative talents programs embedded in business offices and factories. Tung Ho Steel Corp. has proven that added value, with their sustained artist-in-residency program, by inviting sculptors to work side by side with technicians in their hot H beam rolling factory floor. http://www.anb.org.tw/report-single.aspx?id=540 3 diplomacy value: easily understood by quoting Cloud Gate as our classic choice, but seldom do we see the breakthrough in reaching global platforms in International NGOs. Sustained support to our culture NGOs to these platforms will bring out our voice to the world, and brings concrete links for our national profile. The Art can Promote our culture values such as our genuine freedom of expression and multicultural society. Travels for long stays in creative participation settings such as, research or internships, by artist, curators, public and private institution administrators and others from all fields, should be seen as national investment into their potential, plus added culture diplomacy for our island state. they will tie these culture knots for Taiwan in a variety of tangible ways. 4 tourism value: is being milked to the last drop, but dwindling numbers of certain groups of tourists is a new fear. Price undercutting is not a solution, fresh creative contents are needed to ensure higher quality visitors, with longer stays that will contribute to deeper understanding of our island’s culture. New programming will change that hurried two-day visit to a week of dialogue and discovery. 5 social value: has been considered as the new salve to most civic issues, where soft persuasions is needed to change tensions for groups and individuals. The long term support for disaster zones after 921 earthquake and 8 8 landslide, have proven the value of art as therapy, and as employment support too, but sustained support for these programs are still needed not just to disaster areas, but in many villages and other entrenched urban communities, especially younger children and families to learn ways of expression of their circumstances. Any therapists will tell you that such efforts requires long term commitments, and must use new ways to help bring in alternative perspectives to these locations. 6 health value: related to social values, this should be easily understood, as we are facing a universal ageing population whereby managing graceful living of our seniors’ golden years, is a way to reduce medical costs. Art and culture engagement is proven to be the key to strengthen the mind, plus the social and physical capacities of these seniors, if these programs are administered via young creative youths, more dynamic methods will show even higher and lasting effectiveness because their energetic presence. 7 ethnic value: while we are hard at work promoting ours as holder of classic Chinese heritage, fight for the Confucian teachings globally is getting difficult; but our diverse indigenous culture is indeed our treasure, that we can share with many in the Asia Pacific Rim, and has brought us much recognition globally. As witnessed in our sites such as http://en.nmp.gov.tw/index.php. Our indigenous culture groups need support to refresh their culture icons with new creative consultations, by feeding in more creative ways, to show off their culture to the public. Similarly, professionals can help in tracing their traditional culture for intrinsic wisdom which are embedded in their lifestyle of co-existing with nature sustainably. There is much we city folks need to learn away from our urban jungle, their respectful ways on land / water use, where every species in nature has its intrinsic values for a balances health. If we wish the island reach eco sustainability we need that respect first! Similarly the showcasing must include added awareness and mutual respect to the cultures of the influx of new immigrants to our nation. Our newly elected legislator from Cambodia will have much to say on value of her homeland. http://www.dailymail.co.uk/wires/afp/article-3389863/Foreign-bride-Cambodia-make-history-Taiwan-vote.htm These new citizens make us a truly multicultural society 8 environmental value: this may sound far fetch first hand, but now global movement of using green art as the choice of action for bringing proactive action towards the global warming agenda, from public sector to the grass roots individual. The need of Taiwan to be self-sustainable in food, water, energy, and livelihood is at stake now. The arts can put the attention to this issue in many creative ways, so as to complement the warnings of scientists and ecologists. Seeing the presence in Paris of 150 culture NGOs at ARTCOP21 working on their manifesto, in parallel streaming with190 national ministers at COP21, we can see the effectiveness of art and culture action on controlling that 1.5 degree red line! Environmentalists need artists creative collaborations to make the data understood by all. In Taiwan, talents have initiated creative visuals for big data so as to be understood by all. Government can do well to enrich projects like these even further. (see more at http://www. G0V.com) 9 economic value: all of above analysis should prove these cumulative values will bring in savings to our government, and also tangible economic benefits to our industries and to our nation. Thus culture is an investment no doubt, and the multiplier effect is immense if we measure it in various forms of added values, its savings and innovation potentials etc. 10 education value: The work horse of our economy is our labor force. However industry leaders are shouting that our graduates are not ready for their potential jobs. They lack applicable experiences, unfamiliar to creative thinking, plus inadequacy in teamwork. All these are structural problems of programing in academia? If only the arts are permitted more creative engagement from K-12 in all different classes, from science to civic education, whereby students can engage in parallel choice for creative brainstorming, cross production of collaborative acts and art projects, and observing first hand creative processes… If teaching can be away from classroom settings, in real context, it will surely help produce a better work force to our society. These engagements have initial track records in a ten year engagement by our National Culture and Art Foundation program of sending artists to schools. But sustained support is needed directly from the education ministry. This must come with recognition of the professionalism of the artists, with or without formal teaching qualifications. http://arteducation.ncafroc.org.tw/ Hence without further reference to other values, we must recognize that art and culture have unlimited benefits on all levels. Thus, our new cabinet and our new president, please set up opportunities to use our talented youths. Theirs is a generation with uniquely bestowed upbringing. Give them a chance and a platform to prove their worth permitting them to use their creative ideas. The ministry must create systems and mechanisms to connect them to our nation’s higher vision for greater values to our society. Rethink the way annual thematically based outsourcing of events and projects as culture polices. Do not lock culture talents down with only chances in the various niches of short-term products and services for ephemeral consumptions! We must have a wider vision and deeper knowledge of the values of culture. Ensure that the culture minister and his or her team, is working co-creatively with counterparts in the various ministries. Foremost, work with the education minister for effective channeling of arts professional into the system from K to 12. Nurturing creativity in real creative experiences for our younger generation. Next, the economic minister for use of talents in all sectors of society for solving entrenched issues. But be a portal to lead culture as an injection into stimulating innovative mode for our industries’ traditional industries especially. Our foreign minister must let the arts lead the breakthroughs via culture diplomacy. Artists face to face, reach others that may still be unaware of our island’s uniqueness. Entice the environmental minister to use creative solutions in promoting eco sustainability via new techie ways or via virtual reality, and hands on public events in communities, to channel new visions, attract new synergies and refresh the mindsets of our citizens. This will ensure citizens protect our environment, while our industries find creative alternatives that cuts cost, which eventually lead to breakthrough innovations on their production line. Greening industries should not cost more, it cuts long term costs! Our health minister definitely will appreciate the way the arts can reduce the rural or urban stress and ensure effective management of our aging population. Our tourism and transport minister will find more effective use of our arts, not just as attractive events provider, but rethinking in the logic of its approach to the way the public approach to recreation. If only all sectors, and all ministries can reassess their engagement with the culture sector, just by permit refreshing ideas to be applied as a prototype. Last but not least the R&D facets in the Academic Sinica needs to monitor these visionary breakthroughs to justify this trial co-creation is valid in all angels! All governments has their priorities, long and short term needs, creative imaginations will produce innovative out of the box solutions. European Union has many such programs under the canopy of Creative Europe. http://ec.europa.eu/culture/forum/index_en.htm But even in the US government, being hands off by for ideology reasons, does not have a culture budget per se, you still see how each sector uses arts and culture for innovation. For example, the citadel of new thinking such as MIT, has a program CAST, that invites creative artists in their various departments, to avoid tunnel and short sighted vision http://arts.mit.edu/welcome/cast/about/ Invest now into culture for turning the economic fabric of our society by 2020, and be able to reposition our contribution to the Asian and global arena by 2030, as one of the best practices of a sustainable society, on this special island of Taiwan. This will reclaim the true meaning of our island as named by the colonials: the beautiful island of Formosa!